Alternative splicing of the Pkm gene product generates the PKM1 and PKM2 isoforms of the glycolytic enzyme pyruvate kinase. PKM2 expression is associated with embryogenesis, tissue regeneration, and cancer. 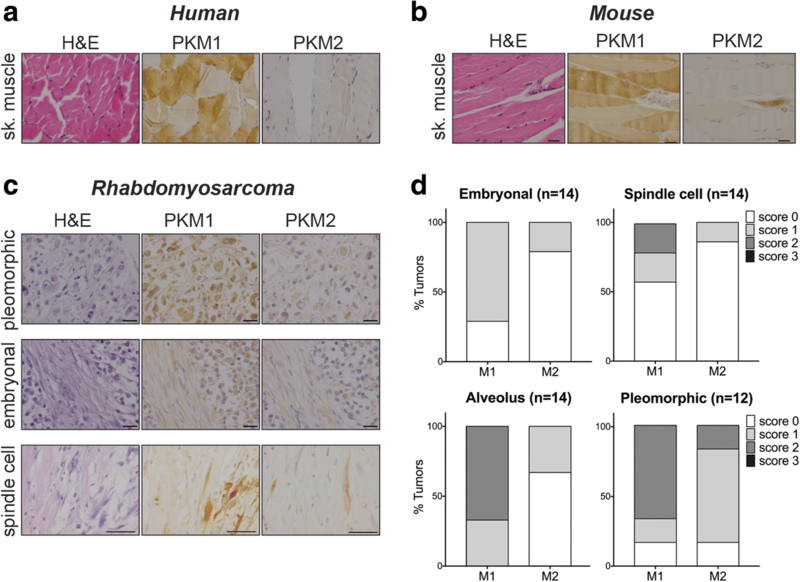 PKM2 is also the pyruvate kinase isoform expressed in most wild-type adult tissues, with PKM1 restricted primarily to skeletal muscle, heart, and brain. To interrogate the functional requirement for PKM2 during tumor initiation in an autochthonous mouse model for soft tissue sarcoma (STS), we used a conditional Pkm2 allele (Pkm2 fl ) to abolish PKM2 expression. PKM2 deletion slowed tumor onset but did not abrogate eventual tumor outgrowth. PKM2-null sarcoma cells expressed PKM1 with tumors containing a high number of infiltrating PKM2 expressing stromal cells. 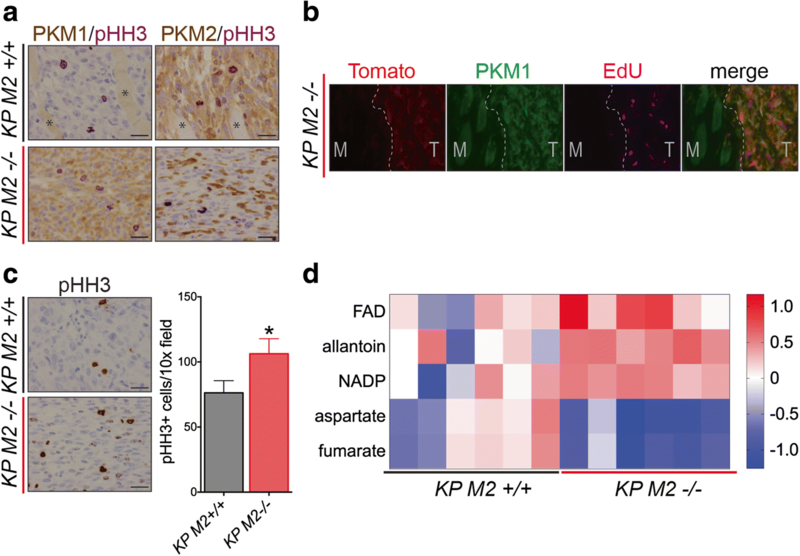 End-stage PKM2-null tumors showed increased proliferation compared to tumors with a wild-type Pkm2 allele, and tumor metabolite analysis revealed metabolic changes associated with PKM2 loss. While PKM2 is not required for soft tissue sarcoma growth, PKM2 expression may facilitate initiation of this tumor type. Because these data differ from what has been observed in other cancer models where PKM2 has been deleted, they argue that the consequences of PKM2 loss during tumor initiation are dependent on the tumor type. Proliferating cells, including cancer cells, favor aerobic glycolysis and display increased glucose consumption and lactate production compared to many non-proliferating cells. Expression of the M2 isoform of pyruvate kinase (PKM2), the glycolytic enzyme that catalyzes the last step in glycolysis, has been implicated in promoting this metabolic state of cancer cells. The pyruvate kinase gene, Pkm, encodes the PKM1 and PKM2 isoforms, which are the result of alternative splicing of mutually exclusive exons. The PKM1 isoform includes exon 9 but not exon 10 and shows a pattern of expression that is restricted in the adult largely to the heart, brain, and skeletal muscle. PKM2, on the other hand, includes exon 10 but not exon 9. Expression of the PKM2 isoform is widespread in adult epithelial tissues and has been associated with embryogenesis, tissue regeneration, and cancer [1, 2]. Importantly, expression of PKM2 impacts the fate of glucose, in part through regulated enzymatic activity. While PKM1 is a constitutively active enzyme, PKM2 enzymatic activity can be inhibited by a variety of cellular signaling events, many of which are associated with proliferation [3–7]. Consistent with this notion, activation of PKM2 enzymatic activity in cancer cells through either exogenous expression of PKM1 or use of small molecule activators leads to delayed xenograft tumor formation [8, 9]. PKM2 is highly expressed in many tumor types, and a number of metabolic and non-metabolic functions in cancer have been attributed to PKM2 [1, 5, 8, 10–15]. However, whether PKM2 is required for tumor formation remains a controversial question. Recent studies of PKM2 function in autochthonous mouse models of cancer have revealed a complicated picture of PKM2 function in cancer. For example, loss of PKM2 in a leukemia and breast cancer model led to contrasting results: while PKM2 loss limited progression in one case, it led to accelerated tumor growth in the other [16, 17]. PKM2 deletion also accelerated tumor growth in a mouse medulloblastoma model . Loss of PKM2 in a colon cancer model driven by APC loss did not alter tumor initiation, growth, or progression . Finally, germline loss of PKM2 led to late onset of hepatocellular carcinoma, at least in part through non-cell autonomous means . In no cases was PKM2 absolutely required for tumor formation; however, the different response to PKM2 loss in various tumors might be indicative of distinct tissue metabolic requirements. In this study, we used a conditional Pkm2 allele (M2 fl ) to assess the requirement for PKM2 in a mouse model of soft tissue sarcoma. In this model, Cre-mediated activation of oncogenic Kras and loss of p53 (KP) in the hind limb of mice leads to the formation of soft tissue sarcomas within 3 months . Loss of PKM2 in this context led to delayed tumor initiation and decreased tumor penetrance. The tumors that formed in KP M2 fl/fl mice expressed PKM1 instead of PKM2. Metabolite analysis of KP M2 −/− sarcoma tissue showed changes in the pool sizes of several metabolites, arguing that metabolism in these tumors changes as a result of PKM2 deletion and consequent PKM1 expression. All animal work was conducted in accordance with a protocol approved by the MIT Committee on Animal Care. KP and M2 flox mouse strains have been described previously [17, 21]. All animals were maintained on a mixed C57BL/6J × 129SvJ genetic background. Sarcoma tumorigenesis was initiated as previously described by intramuscular infection of mice with Ad5-CMV-Cre (University of Iowa Gene Transfer Core) [20, 22]. For histologic analysis, tissues were fixed in 4% formalin, embedded in paraffin, and sections were stained with hematoxylin and eosin (H&E). For immunofluorescence analysis, mice were perfused with PBS, followed by perfusion with 2% paraformaldehyde (PFA). After an overnight fixation in 4% PFA at 4 °C, tissues were placed in 30% sucrose overnight at 4 °C with shaking. Tissue was allowed to equilibrate in OCT:PBS (1:1) solution and embedded in OCT (Tissue-Tek). Frozen sections (10 μm thick) were cut on a CryoStar NX70 (Thermo Scientific). PKM2 antibody (1:500, CST 4053) was used. IHC was performed on 4-μm-thick sections using ABC Vectastain kit (Vector Labs) with antibodies to PKM1 (1:500, CST 7067), PKM2 (1:500, CST 4053), and phospho-Histone H3 (1:200, CST 9701). The staining was visualized with DAB (Vector Labs, SK-4100), and the slides were counterstained with hematoxylin. For dual staining, DAB and ImmPACT VIP (Vector Labs, SK-4605) were used. Hematoxylin and eosin (H&E) staining was performed on a Varistain Gemini automated slide stainer (Thermo Shandon). Soft tissue sarcoma human tissue array, SO2081, was purchased from US Biomax Inc. (Rockville, MD USA). The TMA was scored for PKM1 and PKM2 intensity. Tumors that showed no positive staining were given a score of 0, those with weak staining were given a score of 1, those with strong positive staining were given a score of 2, and those with very strong staining were given a score of 3. ImageJ software was used for quantification of pHH3 staining, and four to five 10× fields were counted per tumor. RNA was isolated from flash frozen crushed sarcoma tissue following manufacturer’s instructions for Trizol (Invitrogen). One to 2 μg of RNA was reverse transcribed following manufacturer’s instructions for High Capacity cDNA Reverse Transcription Kit (Applied Biosystems). KAPA SYBR Fast mix (Kapa Biosystems, KK4604) was used for quantitative PCR with primers listed below. Expression levels were calculated relative to β-actin and normalized to WT samples. Sarcoma tissue lysates were generated from flash frozen ground whole tumors following lysis with ice cold RIPA buffer, supplemented with HALT phosphatase and protease inhibitors (Thermo-Scientific, PI-78420 and 87786). The following antibodies were used for immunoblotting: anti-Hsp90 (1:1000; CST 4877), anti-PKM1 (1:5000; Cell Signaling, 7067), and anti-PKM2 (1:5000; Cell signaling, 4053). Metabolites were extracted from ground flash frozen whole tumors by methanol extraction. For polar metabolite analysis, dried metabolite samples were resuspended in 100 mL of water, centrifuged at 15,000×g at 4° C for 10 min, and 1 mL of supernatant was injected for LC/MS analysis using QExactive Orbitrap mass spectrometer as previously described [23, 24]. Mice were given one pulse of intraperitoneally injected EdU, and tissue was harvested after 3 h. EdU was visualized using Click-iT EDU AlexFluor-647 kit for IF (Invitrogen C10340). For EdU incorporation in cell lines, cells were grown on a monolayer and treated with EdU for 1 h.
RNA-seq gene expression profiles (n = 265) and relevant clinical data (n = 261) for sarcoma (SARC) patients were obtained from the Cancer Genome Atlas data portal (TCGA; cancergenome.nih.gov/). Patients with primary tumor samples and associated survival data (n = 259) were ranked by the ratio of the RPKM (reads per Kb per million mapped reads) values of PKM2 and PKM1 isoform-specific exons. Values greater than one indicate higher expression of the M2 isoform compared to the M1 isoform, with higher values indicating greater M2 isoform expression. Kaplan–Meier survival analysis was conducted to compare patients with high M2/M1 expression ratio (top 20th percentile) to those in the bottom 20th percentile (n = 51 within each group). The log-rank test was used to assess significance. Cox proportional hazards analysis was conducted across all patients in the TCGA SARC cohort (n = 261) to assess the prognostic significance of the M2/M1 expression ratio. Univariate Cox regression analysis for individual characteristics was performed to benchmark single-variable hazard ratios. Subsequently, a multivariable model was implemented to estimate the prognostic value of the M2/M1 ratio while controlling for other patient characteristics (age, gender). Hazard ratio proportionality assumptions for the Cox regression model fit were validated by testing for all interactions simultaneously (p = 0.0856). Interaction between significant covariates (M2/M1 ratio and age) was tested using a likelihood ratio test (LRT) to contrast a model consisting of both covariates with another model consisting of both covariates and an interaction term. All survival analyses were conducted within a 5-year survival timeframe using the survival package in R (www.r-project.org). To inform our study of PKM isoform requirements in soft tissue sarcomas (STS), we examined the expression patterns of PKM1 and PKM2 in normal adult skeletal muscle and STS tissue. This was assessed by immunohistochemistry (IHC) staining using antibodies specific to either PKM1 or PKM2. IHC staining of both mouse and human skeletal muscle confirmed previous reports that PKM1 is the primary isoform expressed in this tissue (Fig. 1a, b, Additional file 1: Figure S1A) . We next stained 48 primary human rhabdomyosarcomas including embryonal, spindle cell, alveolus, and pleomorphic rhabdomyosarcomas (undifferentiated sarcomas) for PKM1 and PKM2 (Fig. 1c). Consistent with the PKM expression pattern of their tissue of origin, the majority of the examined rhabdomyosarcomas showed positive staining for PKM1 (32/48, 67%). Less than half of the examined rhabdomyosarcomas showed positive staining for PKM2, arguing against an absolute requirement for PKM2 expression in this tumor type (Additional file 1: Figure S1B). PKM1 and PKM2 IHC intensity scoring revealed heterogeneity in the distribution of PKM2-expressing tumors according to rhabdomyosarcoma subtypes (Fig. 1d). In contrast to the other three examined subtypes, pleomorphic rhabdomyosarcomas contained a high percentage of PKM2-positive tumors (10/12, 83%). The majority of these tumors also expressed PKM1 (10/12, 83%). In addition to our IHC analysis of PKM1 and PKM2 expression in primary human sarcomas, we also analyzed human sarcoma gene expression data from The Cancer Genome Atlas (TCGA) to determine whether the expression ratio of PKM2 to PKM1 could predict patient outcome . Across > 200 sarcoma patients within TCGA, those within the highest quintile for PKM2/PKM1 expression ratio had a significantly shorter median 5-year survival when compared to either those within the lowest quintile for PKM2/PKM1 expression ratio, or when compared with all other patients combined (Fig. 2a, Additional file 2: Figure S2). Furthermore, Cox regression analysis using this TCGA sarcoma patient cohort showed that a high PKM2/PKM1 ratio was independently prognostic of shorter survival when controlling for age and gender (Fig. 2b). We were intrigued by the disparate PKM expression patterns in normal and transformed skeletal muscle tissue. While normal skeletal muscle exclusively expressed PKM1, a sizeable number of human primary tumors expressed both PKM1 and PKM2. This is in contrast to breast cancer, leukemia, and colon cancer where the normal and tumor tissue both express PKM2 [16, 17, 19]. 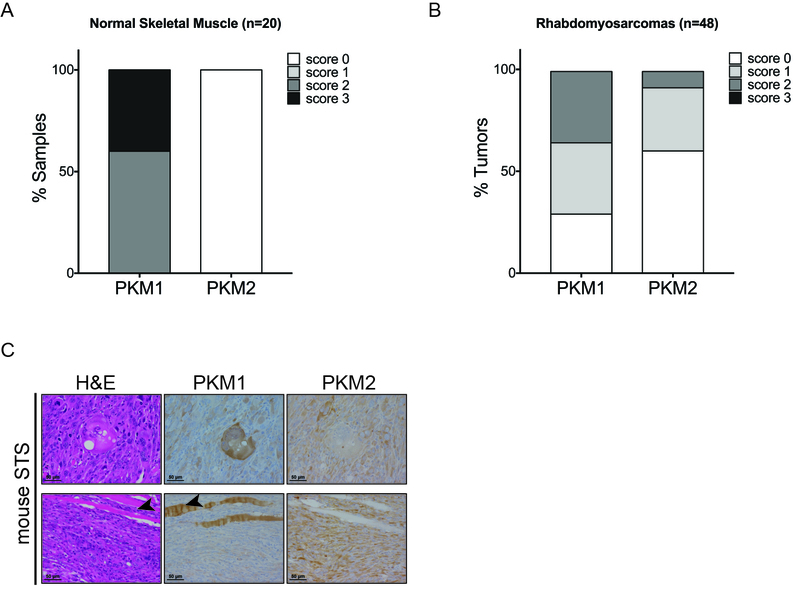 This, in addition to the prognostic value of PKM2/PKM1 revealed by our analysis of the TCGA sarcoma cohort, led us to postulate that expression of PKM2 may play a role in malignant transformation of skeletal muscle tissue to form STS. To directly test this hypothesis in a well-defined genetic context, we used a genetically engineered mouse model of soft tissue sarcoma. Conditional activation of oncogenic Kras and inactivation of p53 in a Kras LSL-G12D/+ ; p53 fl/fl (KP) mouse model by viral delivery of Cre recombinase to skeletal muscle tissue initiates the development of high-grade sarcomas with myofibroblastic differentiation . Cross-species gene expression analysis has shown that tumors from the KP model closely resemble human undifferentiated pleomorphic sarcomas  and our IHC analysis of human pleomorphic sarcomas showed that this subtype of STS is enriched for PKM2-expressing tumors (Fig. 1d). Importantly, IHC for PKM1 and PKM2 on STS derived from the KP model showed that most cells in all of the examined tumors expressed both PKM1 and PKM2 (Additional file 1: Figure S1C). To investigate the role of PKM2 in sarcoma development in the KP model, we crossed mice with a conditional allele of Pkm2 (M2 fl )  to KP mice and performed intramuscular infections of cohorts of KP M2 fl/fl and KP M2 +/+ mice with Ad-Cre (Fig. 3a). In contrast to similar experiments performed in other autochthonous mouse cancer models, we found that deletion of PKM2 concomitant with sarcoma initiation delayed tumor onset and decreased penetrance of the model (Fig. 3b) (p = 0.003 by log-rank test). Deletion of PKM2 delayed the date of tumor onset by approximately 8 days (56.45 days for KP M2 +/+ versus 64.05 days for KP M2 flfl ) (Fig. 3c). To characterize the PKM expression patterns of sarcomas arising in KP M2 +/+ and KP M2 fl/fl mice, we performed Western blot analysis of PKM1 and PKM2 expression in primary tumors. 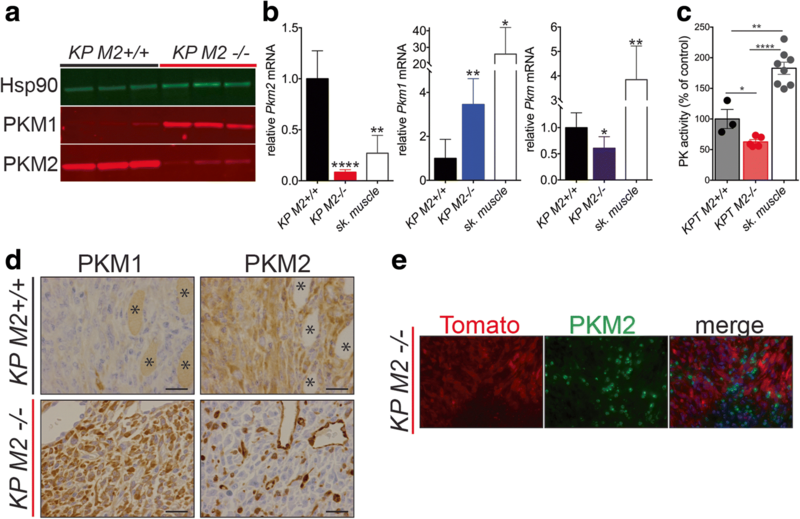 While KP M2 +/+ tumors primarily expressed PKM2, tumors from KP M2 fl/fl mice (KP M2 −/− tumors) lost PKM2 expression and expressed PKM1 (Fig. 4a). Consistent with our protein analysis, qRT-PCR analysis of the same tumors showed very low transcript levels for Pkm2 accompanied by a dramatic increase in the transcript levels for Pkm1 in KP M2 −/− tumors relative to KP M2 +/+ tumors (Fig. 4b). Of note, the levels of Pkm1 in KP M2 −/− tumors were lower than the levels of Pkm1 in wild-type untransformed skeletal muscle tissue. This quantitative assessment of mRNA abundance also revealed that the levels of total Pkm transcripts were reduced in KP M2 −/− tumors compared to KP M2 +/+ tumors. The observed decrease in total Pkm transcripts in KP M2 −/− tumors was accompanied by a reduction in the maximum rate of reaction (Vmax) when pyruvate kinase enzyme activity was assessed in KP M2 −/− tumor lysates compared to KP M2 +/+ tumor lysates (Fig. 4c). Interestingly, normal skeletal muscle tissue showed a significantly higher Vmax for pyruvate kinase enzyme activity than tumors of either genotype. These findings are consistent with what has been described in adult tissue isolated from germline Pkm2 knockout mice  and suggest a common mechanism of decreased total Pkm expression to compensate for replacement of PKM2 by the more active PKM1 isozyme. To further characterize the PKM expression patterns of sarcomas from KP; M2 +/+ and KP; M2 fl/fl mice at the cell and tissue level, we performed IHC for PKM1 and PKM2 (Fig. 4d). Consistent with Western blot analysis, KP M2 +/+ tumors primarily and uniformly expressed PKM2. In contrast, KP M2 −/− tumors consisted primarily of PKM1-expressing cells and also contained a number of cells that had high expression of PKM2. To determine whether the PKM2-expressing cells in KP M2 −/− tumors were cancer cells, we performed immunofluorescence (IF) for PKM2 (Fig. 4e). We used KP mice for this study that carried a fluorescent Cre-reporter allele (Rosa26 LSL-tdTomato ), allowing us to distinguish tumor cells from stroma through tumor-specific expression of the red-fluorescent protein, tdTomato . Consistent with efficient deletion of PKM2 and consequent expression of PKM1 in tumor cells, we found that PKM2 was expressed exclusively in the tdTomato-negative stromal cells. Collectively, these data argue that while loss of PKM2 concomitant with KP sarcoma initiation delays tumor onset, it does not fully abrogate the eventual outgrowth of tumors in most cases. Expression of PKM1 in tumor cells has been shown to limit proliferation and progression in some mouse models of cancer . Furthermore, in breast cancers with PKM2 deletion, PKM1 expression was only observed in the non-proliferating population of tumor cells . To ask whether the proliferating cells in KP M2 −/− sarcomas expressed PKM1, we performed two-color IHC for PKM1 or PKM2 and the proliferative marker, phospho-histone H3 (pHH3) (Fig. 5a). Contrary to the conclusions from breast cancer, we found that a large portion of PKM1-expressing tumor cells in KP M2 −/− sarcomas also expressed pHH3. Thus, once these tumors have been initiated, PKM1 expression does not appear to abrogate tumor cell proliferation. Analysis of 5-ethynyl-2′-deoxyuridine (EdU) incorporation in tdTomato-positive tumor cells was also consistent with this conclusion (Fig. 5b), as was an analysis of proliferating cells in cell lines derived from primary tumors in KP M2 +/+ and KP M2 fl/fl mice (Additional file 3: Figure S3A). Furthermore, expression of PKM1 in sarcoma cell lines derived from KP M2 −/− tumors did not affect the rates of in vitro proliferation as measured through cumulative populations doublings, which were variable across cell lines but did not correlate with Pkm genotype (Additional file 3: Figure S3B). Despite the longer time to palpable tumor formation and the decreased tumor penetrance in KP M2 fl/fl mice, there was no significant difference in the tumor weight at time of death of KP M2 fl/fl mice relative to KP M2 +/+ mice (Additional file 3: Figure S3C). To determine whether KP M2 −/− tumors had higher rates of proliferation than KP M2 +/+ tumors, we quantified pHH3-positive cells in tumors collected at the time of death from mice of each genotype. Unexpectedly, we found that KP M2 −/− tumors had more pHH3-positive cells compared to KP M2 +/+ tumors, consistent with the notion that PKM1 expression in late-stage KP sarcomas does not abrogate tumor proliferation or progression (Fig. 5c). These findings are also consistent with PKM2 loss promoting proliferation in some other tissues [2, 17, 18]. The fact that deletion of PKM2 in our KP model of soft tissue sarcoma led to delayed tumor onset and decreased penetrance but did not appear to limit proliferation or progression of late-stage tumors raised the possibility that KP M2−/− tumors had arisen through an adaptive process that might modulate the effects of PKM2 loss and consequent expression of PKM1. Therefore, we hypothesized that the adaptive process that had allowed for KP M2 −/− tumor outgrowth might involve changes in glucose metabolism that could be apparent as changes in metabolite pool sizes. Therefore, we conducted targeted metabolomics analysis of primary tumors derived from KP M2 +/+ and KP M2 fl/fl mice. The metabolite profiles of primary tumor tissue revealed significant differences in levels of five metabolites in KP M2 −/− tumors compared to KP M2 +/+ tumors: FAD, NADP, and allantoin, which were increased, and aspartate and fumarate, which were decreased (Fig. 5d, Additional file 4: Table S1). Although it is unclear how these metabolic changes are related to PKM2 loss, it is notable that allantoin is a purine catabolite and aspartate plays an important role in purine biosynthesis. Here, we show that PKM2 loss concomitant with tumor initiation leads to delayed sarcoma tumor onset, which is ultimately overcome and accompanied by changes in metabolism. The delay in tumor initiation that we observe upon loss of PKM2 suggests that tumor initiation in this model is partially dependent on the activation of PKM2 expression in tumor-initiating cells. While the exact cell of origin for soft tissue sarcoma in this mouse model is not well defined, several studies suggest that a diverse array of skeletal muscle cell types, including mature skeletal muscle cells and skeletal muscle progenitor cells, can give rise to sarcomas with comparable frequency in this model [29, 30]. The heterogeneity in potential cells of origin for sarcomas raises the possibility that the consequences of PKM2 loss in this cancer type are dependent on the specific cell type that gives rise to the tumor. We have found that while isolated Pax7+ and Sca1+ skeletal muscle progenitor cells express appreciable levels of Pkm1 mRNA, they also express high levels of Pkm2 mRNA (data not shown). The fact that KP M2 −/− sarcomas were ultimately comparable in size to KP M2 +/+ sarcomas shows that the consequences of PKM2 loss can be overcome. Moreover, the metabolic changes that we observe in KP M2 −/− tumors might be indicative of a compensatory change in the metabolic program of these cells compared to KP M2 +/+ tumor cells. It is interesting to note that while PKM1 expression in PKM2-null breast tumors was shown to be limited to a subpopulation of non-proliferating cells , PKM1 was uniformly expressed in KP M2 −/− sarcomas and did not abrogate proliferation in these cells. This may represent a better tolerance for PKM1 expression in non-epithelial cancers. 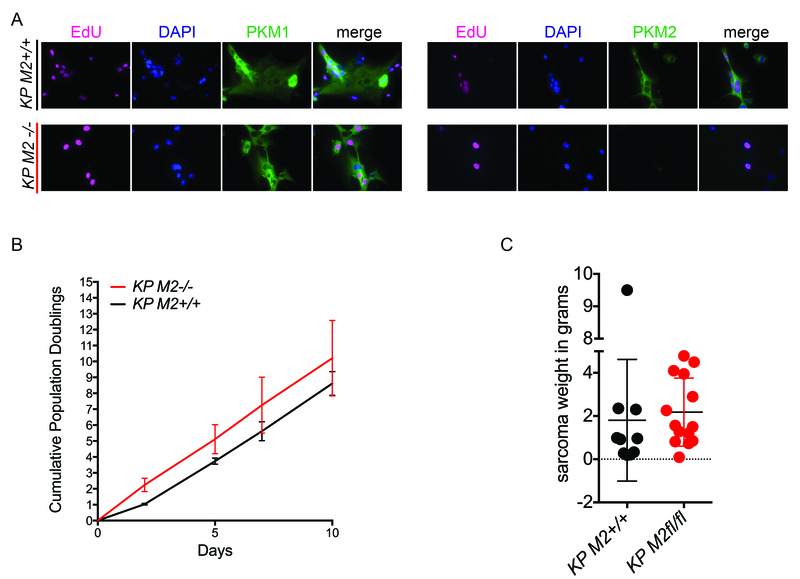 Consistent with these in vivo data, sarcoma cell lines derived from KP M2 −/− tumors also expressed PKM1, and this did not affect their rates of in vitro proliferation. The fact that the in vitro proliferation of KP M2 +/+ and KP M2 −/− cell lines were not significantly different even though end-stage KP M2 −/− tumors contained a higher number of proliferating cells than end-stage KP M2 +/+ tumors may point to a role for the microenvironment in allowing end-stage KP M2 −/− tumors to catch up to their KP M2 +/+ counterparts. Further investigation is needed to delineate the exact mechanism by which KP M2 −/− sarcoma tumors overcome PKM2 loss. This study adds to a growing body of evidence that the importance of PKM2 expression in tumor cells varies across tumor types and might be indicative of different tumor-specific metabolic requirements [16, 17, 19]. Importantly, these results have general implications for the use of therapeutic strategies that target PKM2. The success of PKM2-targeted therapies is likely to depend on both the tumor type and the stage at which a tumor is treated. Our study found that PKM2 loss at the time of tumor initiation in a mouse model of STS driven by activation of oncogenic Kras and loss of p53 leads to delayed tumor onset and decreased tumor penetrance. Nonetheless, PKM2 was not required for eventual tumor formation or outgrowth. 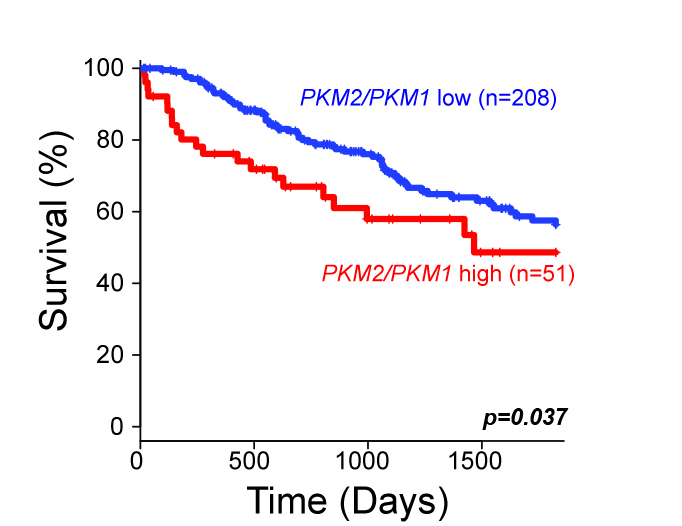 KP M2 −/− tumors express PKM1 and contain infiltrating stromal cells that are PKM2-positive. PKM1 expression in these tumors did not abrogate tumor cell proliferation and, in fact, end-stage KP M2 −/− tumors contain more cancer cells that stain positive for proliferation markers than end-stage KP M2 +/+ tumors. We show that KP M2 −/− tumors have an altered metabolite profile, suggesting metabolic changes accompany loss of PKM2 expression in these tumors. We thank Kim Mercer for technical assistance; Elizaveta Freinkman and the Whitehead Metabolomics Core for the metabolite analysis. We also thank David Feldser and the entire Jacks and Vander Heiden labs for helpful discussions and experimental assistance. We thank the Koch Institute Swanson Biotechnology Center (SBC) for the technical support, specifically Denise Crowley and Kathleen Cormier in the Hope Babette Tang (1983) Histology Facility. The authors wish to dedicate this paper to the memory of Officer Sean Collier for his caring service to the MIT community and for his sacrifice. This work was partially supported by the Cancer Center Support Grant P30CA14051 from the National Cancer Institute and by grants from the Howard Hughes Medical Institute (T.J., M.G.V.H. ), the Burroughs Wellcome Fund (M.G.V.H. ), the Ludwig Center at MIT (M.G.V.H. ), Stand-up to Cancer (M.G.V.H. ), the MIT Center for Precision Cancer Medicine, and the Department of Health and Human Services R01CA168653 (M.G.V.H.). T.L.D. was partially supported by a National Defense Science and Engineering Graduate (NDSEG) Fellowship Award. V.G. was supported by a Jane Coffin Childs Memorial Fund Postdoctoral Fellowship. T.J. is a Howard Hughes Investigator, the David H. Koch Professor of Biology, and a Daniel K. Ludwig Scholar at MIT. TLD, VG, CAL, and KMM performed and/or supervised experiments. RTB and AB were involved in the data analysis. VG and CAL gave constructive input on the experimental design and data analysis. TLD, TJ, and MGVH conceived and designed the study and were involved in the interpretation of datasets and writing the manuscript. All authors read and approved the final manuscript. All animal work was conducted in accordance with a protocol approved by the MIT Committee on Animal Care. M.G.V.H. is a consultant and scientific advisory board member for Agios Pharmaceuticals and Aeglea Biotherapeutics. The other authors declare that they have no competing interests.